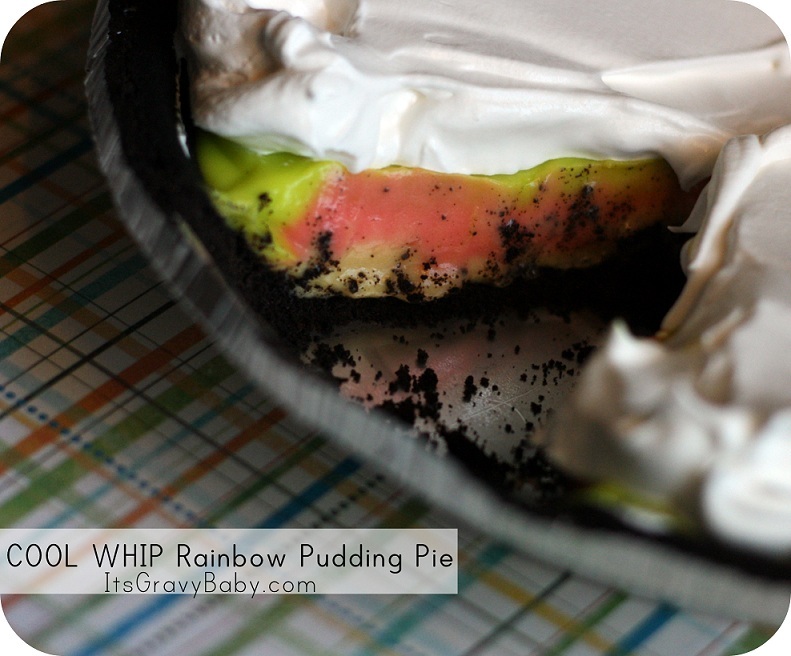 COOL WHIP Rainbow Pudding Pie - Recipe - It's Gravy, Baby! Bryson is following in his dad’s footsteps- he loves to cook. If someone is working in the kitchen, he’s right there too. He’ll contentedly sit on the counter stirring whatever is cooking. I love that about him and I take every opportunity to nurture and encourage his love of cooking. I’m so proud that my mother-in-law taught my husband how to cook and I want to do the same for my boy. He’ll help with any meal, but when I mention the word “rainbow” and “pie” in the same sentence- he is ready to start working! This is a super simple recipe with very little work involved. There is no heat or cooking required so it’s safe for little ones to help out. 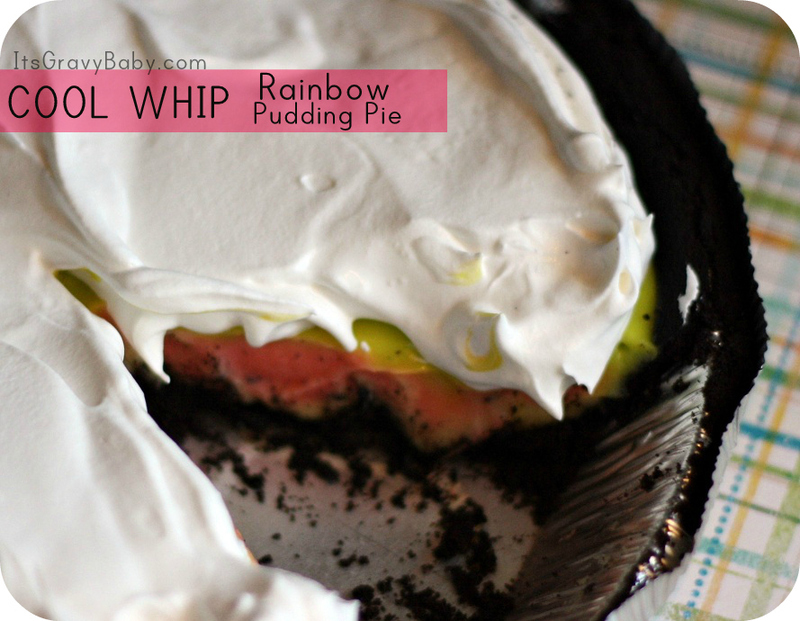 It’s a basic pudding pie, turned rainbow, and made even more delicious by adding COOL WHIP Whipped Topping. -Mix the pudding and milk according to the directions on the box. -Divide the pudding into 3 bowls (more if you’d like)- about 2/3 cup per bowl. 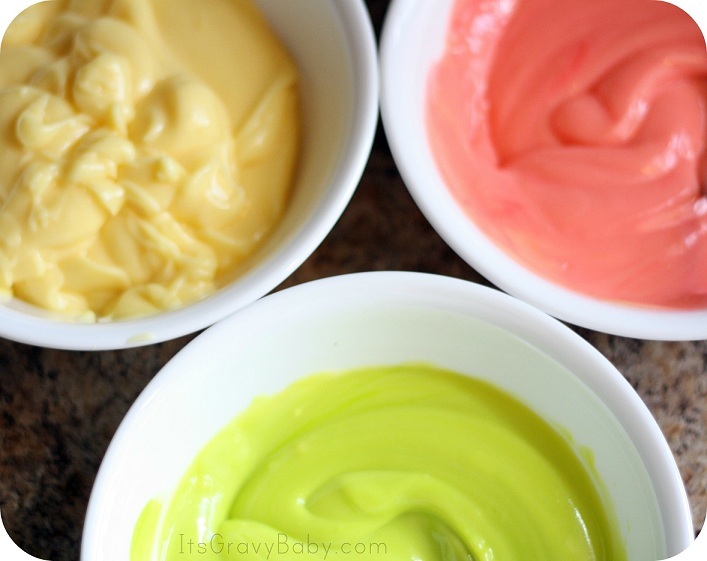 -Add a few drops of color to each bowl. We used green and pink and left one plain yellow. You can use more, but 3 works great for nice thick layers of color. -Stir to incorporate the colors- kids love this part so let them get involved. -Layer the colored pudding in the pie crust. Use the back of a spoon and try not to mix colors. -Allow the pudding pie to set up in the refrigerator for about an hour. -Top with COOL WHIP and enjoy! Bryson was so proud of our rainbow pie. We took it to dinner at my parent’s house and he couldn’t wait to tell them what we had made for dessert. I like that this pie doesn’t require much effort- it can be assembled in a matter of a few minutes, but makes a big impact. By covering it with a layer of COOL WHIP, it just looks like an ordinary pie. When you slice into it though, you are surprised with vibrant colors! The COOL WHIP is kind of like the cloud to the rainbow- it adds that perfect touch! I didn’t think about it while making this recipe, but you could add some sprinkles over the COOL WHIP for another fun touch. The options are endless with different color layers and sprinkles, but the COOL WHIP is not optional, in my humble opinion. It is the perfect finishing touch to this surprisingly colorful and easy enough for every day dessert. That looks super yummy … I love that you used the Oreo crust. mmmmm! how fun. I LOVE pudding pies! Love all of the fun colors, this is totally something my boys would go for. YUM. that looks so yummy…love it..it’s so colorful…thank you for sharing.